Apparently, a godzilla is destroying the natural gas market. Don't worry, there isn't a giant sea monster preparing an attack. Rather, predictions of an extremely warm winter -- driven by what meteorologists have dubbed a "Godzilla" El Nino -- have caused natural gas prices to plummet dramatically. Natural gas prices tumbled 9% on Monday to three-and-a-half year lows. They're already down 18% in October and nearly one-third so far this year. Meteorologists are predicting the unseasonably warm fall temperatures to continue into the winter, which would diminish demand for natural gas to heat homes and businesses. 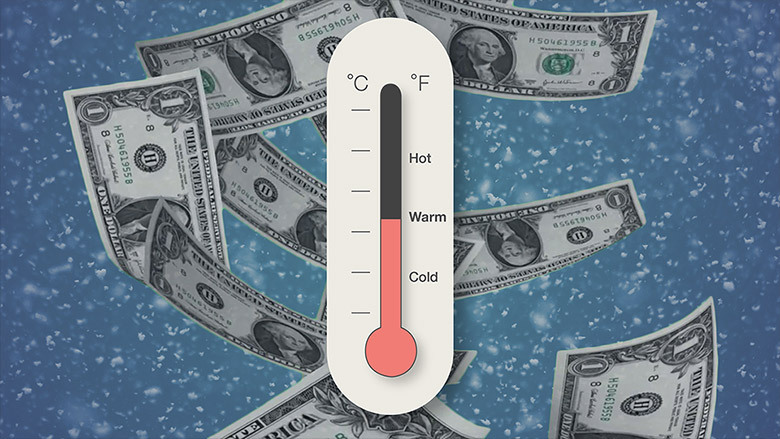 "A warm winter is the last thing this market needs," Bank of America Merrill Lynch commodity strategist Sabine Schels wrote in a research report. Schels believes a mild winter is a "big risk" and could cause a "gas glut" in the coming months. It's great news for people who hate brutally cold winters. It's also good for their wallets. Americans are already saving big time when they fill up their cars at the gas station. Crude oil prices tumbled below $44 a barrel on Monday as the supply glut in that market persists. The average price of a gallon of gas now stands at $2.20, down from $3.05 a year ago, according to AAA. Now investors are betting El Nino will lower already weak demand for natural gas. That would be a big change from the past two winters that slammed many parts of the U.S. with freezing temperatures. "With El Nino increasingly the major buzz word for this winter, which has historically meant a mild winter, (natural gas) producers may be increasingly grasping at straws," Barclays analysts wrote in a recent report. But as everyone knows, weather patterns are notoriously difficult to predict. So if the El Nino effects are more muted, natural gas prices could shoot back up as the market readjusts. The natural gas industry has already been grappling with tepid demand amid the so-so economy. Schels said industrial demand growth "is in the doldrums," pointing to the lowest level of U.S. manufacturing growth since May 2013. Much like crude oil, there is an oversupply problem depressing prices in the natural gas market. In fact, inventories have swelled near record highs. Shares of natural gas companies dropped on Monday. Chesapeake Energy (CHK)and Kinder Morgan (KMI) fell 8% and 4%, respectively. Natural gas exchange-traded funds (ETFs) also retreated, including the United States Natural Gas Fund (UNG) and ProShares Ultra Bloomberg Natural Gas (BOIL). But don't get too used to the cheap natural gas prices though. BofA Merrill Lynch remains "convinced" prices will rebound during the second half of next year and beyond.